Red and white striped cami crop with adjustable straps. Matching skirt sold seperately. Model is wearing a size small. 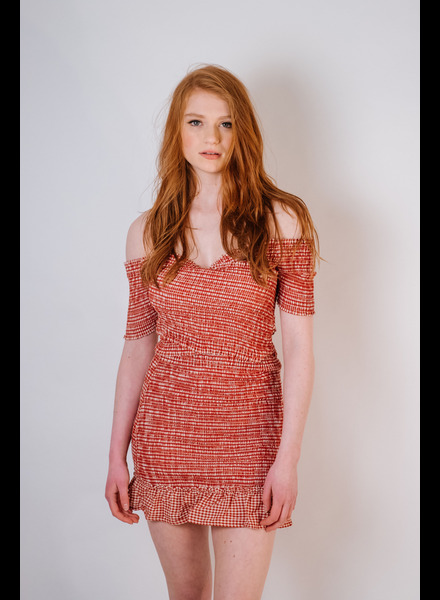 Dusty rose colored linen feel hatler crop top. Model is wearing a size small. Black lined crochet bra style crop top with adjutable straps and side button closure. Model is wearing a size s/m. Blue hawaiian print crop top with double tie back closure. Model is wearing a size small. Pants so separately. Striped knit halter top with grey string ties. Model is wearing a size small. White gauze rouched tube crop top. Model is wearing a size small. Black gauze rouched tube crop top. Model is wearing a size small. Fushia tie front linen crop top with stretch back. Model is wearing a size small. Pants sold separately. 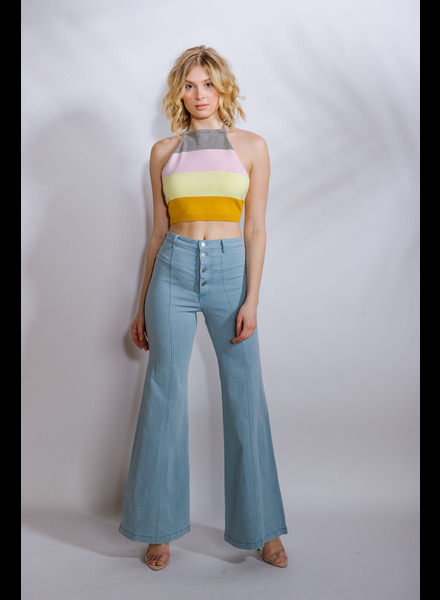 Sleeveless yellow striped cropped top with bottom tie. Model is wearing a size small. Vintage cream colored rouch front crop top with ots flutter sleeve. Model is wearing a size small. Striped rouched off-the-shoulder top with ruffled edging. Model is wearing a size small. Black open short sleeve knit crop top with back tie detailing. Model is wearing a size small. Striped tie bust crop top with adjustable straps. Coordinating pants sold separately. Model is wearing a size small.